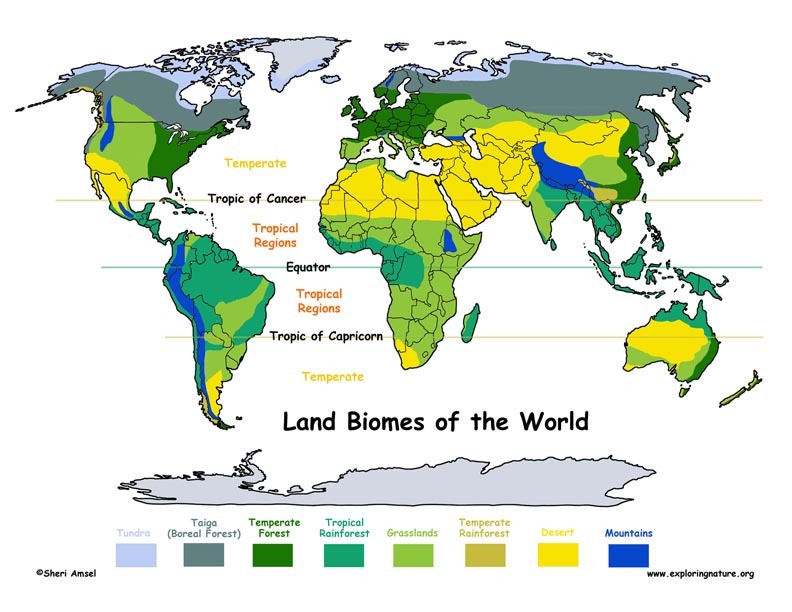 Biomes are regions of the world with a similar climate – the amount of rainfall and temperature. The climate affects which plants will grow and in turn which animals (and other living things) can make their living there. Every community of living things is adapted for survival in the biome in which it lives. A community is many different kinds of organisms living together in one habitat.The type of soil affects a biome to a lesser degree, but still plays a role. There are both terrestrial biomes (land) and aquatic biomes (water) on Earth. Terrestrial biomes make up less than 30% of the Earth's surface. The rest are aquatic biomes. The climate is not the same every day. It is a general weather pattern for a region over time. 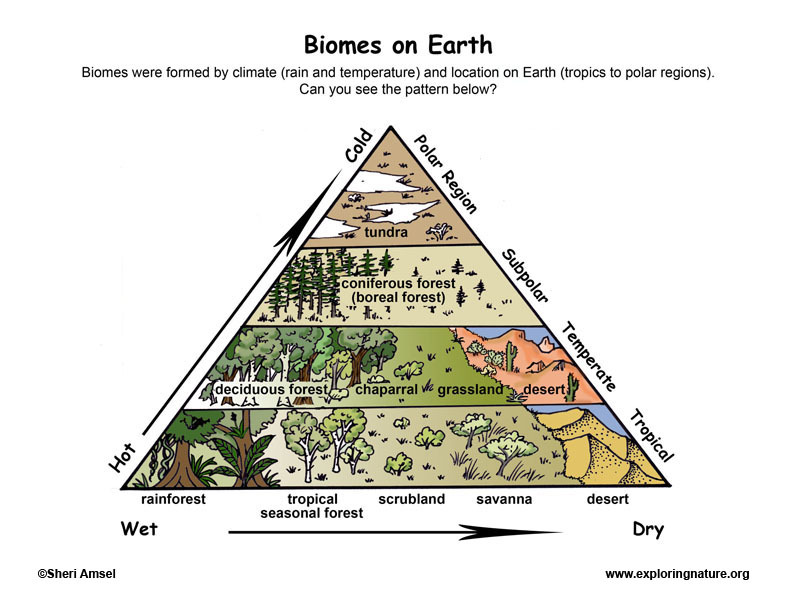 There are three main climate zones on Earth that help form our biomes – Tropical, Temperate, and Polar. Tropical zones are near the equator. They get the most direct sunlight for 12-hours a day all year round. They are where you find the hottest biomes. 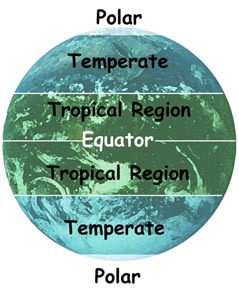 As you move away from the equator north or south, you enter the temperate climate zones. The temperate zones have colder winters with short days and hot summers with longer days. This is the climate zone of the United States. Furthest from the equator you reach the polar zones. The North and South Poles are the coldest zones on Earth with long, dark winters and short, milder summers that experience 24-hours of sunlight at their peak.Yet not all areas in each of these zones have exactly the same climate. Different landforms, such as mountain ranges and large bodies of water can affect the climate. For example, a mountain range can block rainfall from reaching an area (rain shadow), making it a dry, desert region. Being near the ocean can also affect the climate of an area. The ocean holds its temperature longer than land, so coastal regions tend to be milder – cooler in the summer and warmer in the winter than inland regions. Even altitude can affect climate. One tall mountain can have several climate zones and as a result several biomes. At its base it can have mild, temperate forests, while the top is a cold, windswept tundra biome. 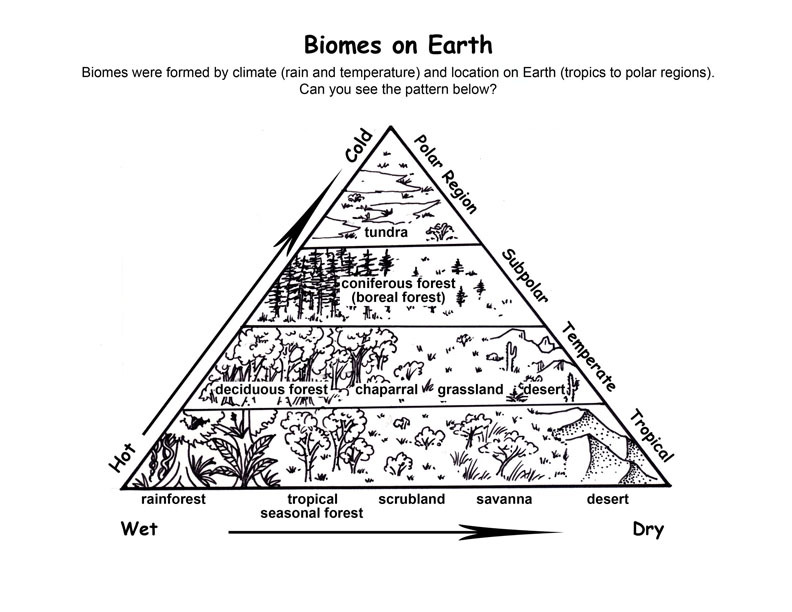 So the locations of different types of biomes depend on the climate, landforms and altitude. 1. Looking at this chart, you can see that the hotest regions (bottom row) have many biomes types depending upon the amount of rainfall. Can you list from the most rainfall (wettest) to the least rainfall (driest) what kinds of biomes you would find in this hottest region? 2. The regions with the most rainfall (wettest) have the richest plant life (left side). Looking at the chart, can you name the these richest biomes going from the hottest locations to the coldest? 3. Where on Earth might you find the "tropical desert" seen on the chart? 4. Where might you find the coldest desert? To make black and white copies for your whole class, see the copy-friendly version below that.